In the regulation shots both the players, Deepika Kumari and Lisa Unruh were tied at 5-5. The match then was decided by a playoff. But, interestingly, even in the playoff both the players scored nine points, and ultimately Deepika was declared the winner as her shot was closer to the center of the target. On why she failed to win a medal at the recently held Asian Games, the World Number eight said "Before the Asian Games, I had dengue fever and then I lost my strength. I could not even draw my bow. After the Asian Games, I took a break of 15 days before coming here". 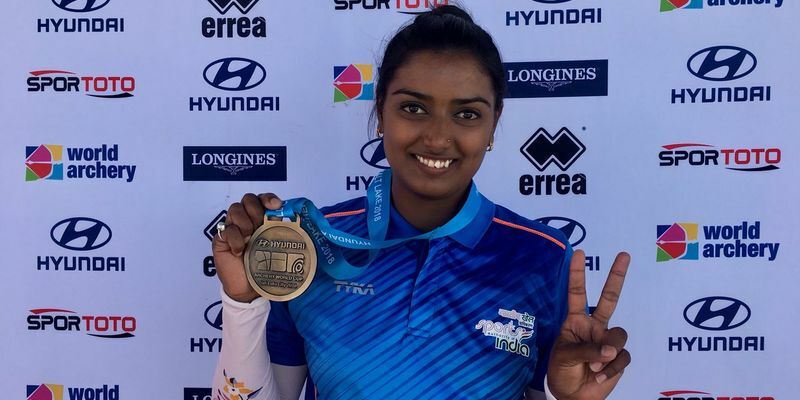 In the 2016 Rio Olympics, Deepika Kumari entered the tournament as the World Number One but made an early exit from the tournament. The story repeated in the recently held 2018 Asian Games and she disappointed once again by losing to Chinese Taipei’s Chien Ying Lei in the women’s recurve event. Finally, she did not let go a chance to win a medal in the 2018 World Cup even though she was on the tour without a coach. "This was for the first time I shot at a big competition like this without a coach. But I'm very happy. The stronger the competition, the better we get," Deepika told PTI. "Most of the times, I end up losing a shoot-off so I started panicking. I told myself, 'I will accept whatever be the result. I will just give my best shot. I'm satisfied with the arrow," she said after the thrilling win. " This is the fifth medal for Deepika in the world Cups who has made a reputation for herself of being a choker in the top events like Olympics and the Asian Games. Though in the World Cups she has done relatively well, she now has a bronze and four silver medals to her name, though a gold medal is missing. "I'm happy for the bronze. I wish I could convert this silver/bronze medals into a gold sometime."